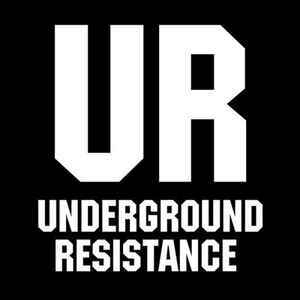 Underground Resistance is probably the most militantly political outcropping of second-wave Detroit techno. Combining a grubby, four-track aesthetic, an almost strictly DIY business philosophy, and an oppositional, militaristic ethos similar to Public Enemy without the drama (or the familiarity; the members refuse to be photographed without bandanas obscuring their identities), UR have redirected their portion of the Detroit techno legacy to social activist ends, trading mainstream popularity and financial success for independence and self-determination. Begun in the early '90s by Detroit second-wave trinity Mike Banks, Robert Hood & Jeff Mills, UR adapted the flavor and kick of early Detroit techno to the complex social, political, and economic circumstances in the wake of Reagan-era accelerated inner-city decline, and was formed as an outlet for uncompromising music geared toward awareness and change. The early UR catalog is defined by a typically Detroit combination of Motown and Chicago soul, and ruthless, at times caustic lo-fi techno, acid, and electro (Mills' background is in, among other things, Chicago industrial and EBM-style electro-techno, with Banks and Hood both coming from a solid house and techno base). Much of the label's early output was the product of various permutations of Banks, Mills, and Hood, both solo and in combination, before Mills and Hood left UR in 1992 to pursue (and achieve) international success. Banks continued to operate UR in the wake of the split, releasing EPs such as "Return of Acid Rain," "Message to the Majors," and "Galaxy to Galaxy" under the UR banner, as well as 12-inches by increasingly renowned artists such as Drexciya, Suburban Knight and Scan 7. The first actual full-length credited to Underground Resistance was 1998's Interstellar Fugitives. When the UR and Submerge Recordings Headquarters moved from 2030 Grand River to 3000 E Grand Blvd., the UR 'family' transformed again by assigning new members such as DJ 3000, S², Aquanauts, Buzz Goree and most notably the live band Los Hermanos. wow no comments at all? well i guess its unsurprising considering how words cant even begin to describe how important UR is.